When read through the list of chapter books we either read aloud or listened to on Scribd, I discovered that I don’t keep nearly as good track of the children’s reading life as I do my own. I kept thinking of more books we’d read that I forgot to record. Some of this is because Davy reads or chooses some, and I read or choose others. My daughters loved going over the list of books they’d read, and thought they were all favorites, but we narrowed it down to ten. Our daughters were 6 and 4 when they listened to these. Some of them were at the top of their level of understanding, but I found if I stopped occasionally to explain unfamiliar words and make sure they are following the plot, they could enjoy books that are for older children. When they listen to audio books, I try to find ones that are more on their level since I rarely pause the audio book to explain things. 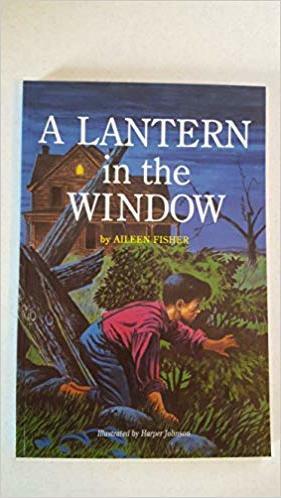 A Lantern in the Window by Aileen Fischer. Peter is curious about many things, but especially about the strange goings-on at Uncle Eb’s farm along the Ohio River. A lantern in the attic window, a skiff being rowed across the river, talk of parcels being delivered. This book is one of my favorites to introduce children to the Underground Railroad. I remember it being read to me when I was in school, and I also read it to my students. The Moffats by Eleanor Estes. There is a rarely a dull moment in the Moffat household. The four Moffat children get into all sorts of scrapes, including getting trapped in a bread box for hours and leading the speaker for the Salvation Army far out of his way. The Trumpet of the Swan by E. B. White. Charlotte’s Web may be the more well known of E. B. White’s books, but The Trumpet of the Swan has become the favorite. Louis the Swan can’t talk, but he learns to play a trumpet. His friend Sam teaches him how to read and write and he carries a slate around his neck to write out his messages. He finds jobs at various places because he is determined to earn enough money to pay for the trumpet, which his father stole from a music store. All-of-a-Kind Family by Syndney Taylor. A delightful tale of a Jewish family of five sisters raised in the upper east side of NYC. I enjoyed the girls’ good-natured camaraderie, and the life lessons they learned. Miracles on Maple Hill by Virginia Sorensen. Marly and her family move from the city to a farmhouse on Maple Hill. They get to experience miracles with each season—sugar season, the woods coming alive with wildflowers, fall foliage, and sleigh rides in the snow. We listened to the full cast audio, which was a treat. Mercy Watson to the Rescue by Kate DiCamillo. Mercy Watson is not just a pig; she’s a porcine wonder. Her favorite food is hot buttered toast (Incidentally, Zoe still asks for “a great deal of hot buttered toast” for breakfast.) When the Watson’s bed starts to fall through the floor into the kitchen below, Mercy races off to alert the fire department. This silly book will delight young listeners. Betsy-Tacy by Maud Hart Lovelace. When Betsy’s family gets new neighbors, she’s delighted that they have a girl named Tacy. The two soon become inseparable, and everyone refers to them as Betsy-Tacy. Together they have many enjoyable adventures. A Bear Called Paddington by Michael Bond. We tried this book a few years ago, and it was not a favorite, but I’m so glad we gave it another chance. We are now going through the whole series. A bear sails across the ocean from deepest darkest Peru and ends up in Paddington Station in London where he is discovered by Mr. and Mrs. Brown. Paddington gets into many charming adventures and misadventures. The Secret Garden by Frances Hodgson Burnett. After her parents died, Mary Lennox left her home in India to live with her Uncle Archibald Craven on the edge of the English moor. She had no Ayah or governess to look after her in her new home, so she began to wander about in the vast gardens of Misselthwaite Manor. When she learned there was a garden that had been shut up for ten years, ever since the mistress of the estate died, her curiosity was piqued. She also began to wonder about the crying she heard at night, even though the servants insisted that it was just the wind whistling on the moor. Pollyanna by Eleanor Porter. After Pollyanna’s father died, leaving her orphaned, she moved in with her aunt Polly, a stiff, proper old maid. Pollyanna’s father had taught her to play the “glad game” and she couldn’t help telling everyone she met about the game, leaving a trail of happiness in her wake. However, one day Pollyanna’s ability to play the game was seriously tested. What chapter books have you read recently that are worth sharing? Disclaimer: If you make a purchase through the links on this page, I may receive a small affiliate commission, at no additional cost to you. Apr 18 What's in the Fridge?